Our studio sessions are designed to include certain essential newborn portraits that we believe every family deserves, and there’s a lot more to it than photographing just the baby. Here are eight images that we think are must-haves. You can (and will) take an insane number of pictures of your new baby. But how often will you get a great image of the entire family together? The family photo is the most important image we think we can provide. After all, this will be your very first official photo after your family of two becomes a family of three. You will be grateful that you have this photo from such a fleeting period in your lives, and we know that it will mean more to this child as an adult than any of the thousands of images they will surely have one day of themselves alone. New moms, just a week or so after giving birth, typically do not feel like being photographed. But a classic portrait of a mother holding her newborn is absolutely essential, and we insist on documenting this special connection in every session. A brand new mother taking her first steps into motherhood is one of life’s most precious moments, and not only does this mother deserve this photograph, so does this baby. 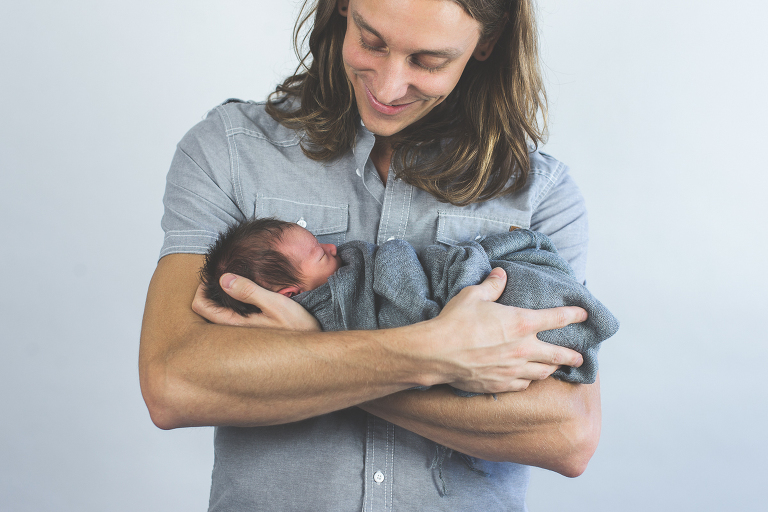 A portrait of a man who has just become a new father is definitely an essential newborn portrait, and there’s no doubt that this sweet bond deserves to be chronicled for every family. The contrast of a towering father gently cradling his tiny newborn melts our hearts every time. Mothers, especially, will treasure the picture of their new baby in Dad’s arms. This one’s a given. 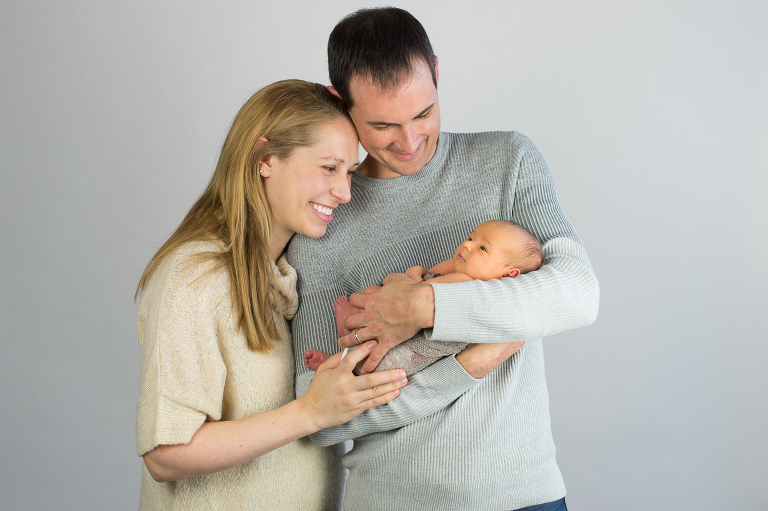 Every new parent and grandparent looks forward to sharing the pictures of their new baby, and we will certainly spend much of the session focused on photographing the baby. We always start with a clean and simple white backdrop, because we believe classic and organic is the perfect way to highlight their precious faces. We like to say, more of the baby, less of everything else. Was she ever that small? You’ll look back and marvel at how she could have ever fit into your hands. That’s the reason we always take this image…to document this tiny new life as soon as we can after she arrives so that you’ll never forget how tiny she once was. And newborns are not this size for very long at all. Within a month, she won’t fit in those hands the same way, and that’s why this shot is essential for every new parent. Capturing a brand new big sister (or big brother) is one of the most important images for families with older kids. Siblings definitely deserve a portrait to document the beginning of a brand new friendship and the unique relationship they’ll share as they navigate life side by side as siblings. We like to imagine the memories and stories that this image will trigger when these two are looking back at it 40 years from now. The hair on the top of his head, tiny fingers and toes, belly buttons and eyelashes… these are the details that make every baby unique, and we don’t think they should be overlooked. Every tiny wrinkle will be dear to your heart, and that’s why you’ll love looking back at the million little parts that make him yours. 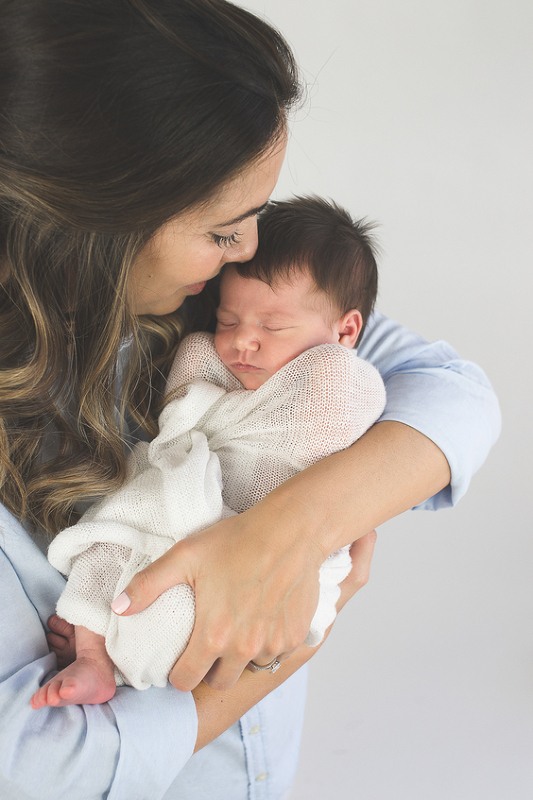 Whatever it is that your little one gives us — if it’s a smile, or a yawn, or the way they rub their hands over their eyes, stick out their tongue, give us a wink, or pull out a giant stretch — we love to document these sweet gestures. A window into your little one’s personality, you’ll cherish the memory of all those little things they did to make you smile.